KUALA LUMPUR --- Visitors to Defence Services Asia 2018 (DSA) in Kuala Lumpur, Malaysia, will be able to visit Leonardo (at stand number H2C, 20426) to find out all about the Company’s latest-generation aircraft, helicopters, naval, air defence and airborne electronics systems. Leonardo has supported the security of Malaysia for many years and has representative offices in Kuala Lumpur. Leonardo’s presence in Malaysia includes over 60 helicopters in service with the Malaysian Armed Forces, Fire & Rescue Department (Bomba), Royal Malaysia Police, Maritim Malaysia, commercial and private owners. For the Royal Malaysian Navy, the Company has supplied naval guns such as the OTO 76/62 SR "super rapid", light torpedoes and heavy "Black Shark” torpedoes. Supporting the monitoring of the whole of Malaysia’s airspace for both civil and defence applications, Leonardo has provided its RAT31DL for air defence and has delivered air traffic management solutions for Mersing, Langkawi and Kuala Lumpur International Airports. In March, Leonardo completed Factory Acceptance Test activities for the upgrade of the new air traffic control centre at Kuala Lumpur International Airport (KLIA). At DSA, Leonardo’s main focus will be on Malaysia’s maritime security requirements, offering solutions based on the latest technology such the ATR72MP patrol aircraft. In the region, there is a major emphasis on protecting maritime territory, for example safeguarding commercial activities, fighting piracy and providing coastal security. Critical to this offer is the Company’s ATR 72MP, which was exhibited for the first time outside of Italy at Malaysia’s LIMA exhibition last year and is being offered to Malaysia for its maritime patrol requirements. The ATR 72MP is equipped with Leonardo's ATOS surveillance mission system, which offers a user-friendly ‘mission tactical picture’ by fusing data collected by the aircraft's suite of sensors, including the Leonardo Seaspray AESA surveillance radar. For Malaysia’s anti-submarine and anti-surface warfare requirements, Leonardo is promoting its latest-generation AW159 helicopter. Equipped with Leonardo’s Seaspray 7000E series AESA radar, which has a patented small-target detection mode that can identify submarine periscopes, as well as a sonar, EO sensors, anti-surface missiles and torpedoes, the AW159 is the most capable multi-role maritime helicopter in its weight class. 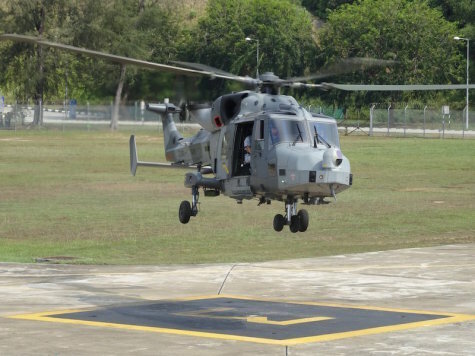 It is already in service with the UK’s Royal Navy and the Republic of Korea Navy and is being offered in Malaysia to meet its future naval helicopter requirements. Other helicopters to be showcased at DSA include the best-selling AW139 and AW189 helicopters, more than 30 of which are in service in Malaysia performing a wide range of roles. Leonardo is also continuing to expand its helicopter capabilities in Malaysia through a further programme of investment centred on its regional maintenance and support centre at Kuala Lumpur's Subang - Sultan Abdul Aziz Shah Airport. With heritage and expertise in military pilot training and a longstanding position as supplier of training assets to the Royal Malaysian Air Force, Leonardo is presenting its M-346 aircraft to Malaysia. The M-346 is the most advanced jet trainer aircraft available on the market today and the only one specifically designed to prepare pilots for the latest generation of high performance aircraft. The M-346 is a winner of global competitions and is in service with the air forces of Italy, Singapore, Israel and Poland, which recently announced an order for four additional M-346s. The M-346 is the cornerstone of an integrated training system which, thanks to a Live-Virtual- Constructive environment, allows for the simultaneous, real-time training of pilots in the air and on the ground in the Full Mission Simulator in complex, networked scenarios. An evolution of the proven M-346 advanced jet trainer, the new M-346FA (Fighter Attack) variant is a highly efficient and reliable radar-equipped multirole combat aircraft designed to meet an increasingly wide range of operational needs. With an integrated Grifo multi-mode fire control radar from Leonardo, targeting and RECCE pods and a defensive aids system, the M-346FA is well suited to air-to-ground scenarios, performing CAS/COIN and Interdiction with Precision Guided Munitions, air-to-air missions such as air policing and airspace control and tactical reconnaissance, all at a far lower cost than with front-line fighters. For air-defence and surveillance, Leonardo’s RAT31DL and KRONOS radar systems will be on show. With over 50 systems sold worldwide, including to Malaysia, the Company’s RAT31DL is NATO’s primary air defence sensor. KRONOS is a multi-functional radar family which can detect, track and identify targets and to provide weapon systems with targeting data, including the provision of TBM (Tactical Ballistic Missile) defence capabilities. The KRONOS radar family includes versions for naval and land missions and around 50 systems have been sold to date. As a truly international company, Leonardo has the capability and flexibility needed to be able to export its proprietary European technology to customers around the world within partnering agreements, local collaborations and JVs. One such area is airborne electronics. The company’s Seaspray and Osprey AESA (Active Electronically Scanned Array, or E-scan) surveillance radars are designed and manufactured in the UK and so fully exportable to Malaysia and the surrounding region. As well as radars, Electronic Warfare (EW) systems on-show at DSA include Leonardo’s SEER radar warning system, which keeps crews aware of potentially hostile radar emitters. SEER is currently being offered to the Royal Malaysian Air Force and other customers in the region and was selected last year by the Indonesian Air Force. Visitors to DSA will also be able to virtually explore the latest generation of Leonardo’s sensors and systems on the bridge of a multi-role naval vessel. ‘Immersive reality’ on the Company’s stand will see guests experiencing naval capabilities including a multi-functional radar, friend-or-foe detection and infrared sensors for acquiring and tracking targets, integrated communications systems and satellite radio. Also on show will be information superiority capabilities for critical military communications, based on Software Defined Radio (SDR) technology.